A portrait of the Wolf in bas-relief , this amulet captures a frisky glance for our Lupine friend. A totem for some, a friend for others, the Wolf had carried a strange history of fear from our early lore: Peter and the Wolf, Little Red Riding Hood and many other stories cast the wolf in fearful scenarios. Yet history describes the brothers Remus and Romulus were raised by wolves, who later founded Rome itself; lending an aspect of very human qualities: both nurturing and intelligent. In Native American lore the Wolf represents loyalty, perseverance, and stability and regarded as pathfinders and teachers. Seeing that Wolves were skillful and resourceful hunters, shared food with the entire pack, and hold strong family loyalties – Native American honored the Wolf in story and song, rites and practices. The Blackfeet, Pawnee and Cheyenne described ‘wolf helpers’ who guide the lost or outcast, feeding and protecting them, guiding them to safety. In celebration of this noble creature, I have created the Wolf Amulet, capturing the image without too much depth for easy wear and comfort. It hangs by a back bail behind the piece to offer the appearance the wolf floats on your chain or cord. 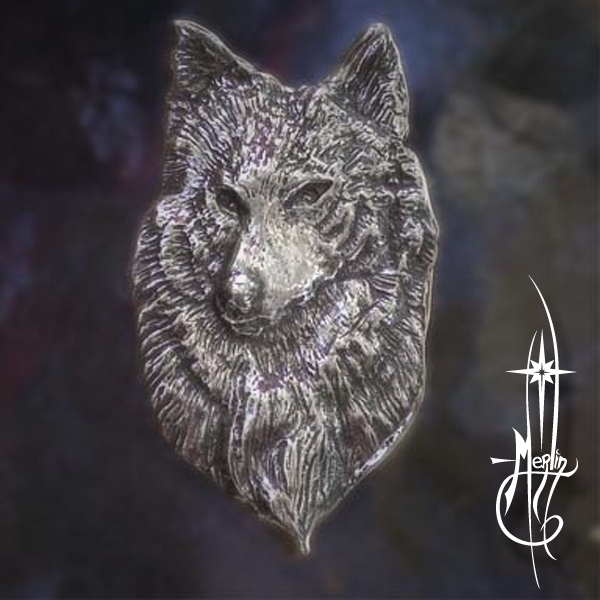 The Wolf Amulet is for those who love wolves and their lore; who wish to emulate their noble qualities and offer support to preserving them for future generations. Beautiful. I need to own it. Where do I find the price? Roll over “The Wolf Amulet” and you can click it!